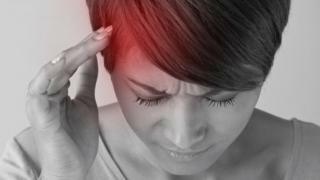 A new approach to preventing migraines can cut the number and severity of attacks, two clinical trials show. About 50% of people on one study halved the number of migraines they had each month, which researchers at King’s College Hospital called a “huge deal”. The treatment is the first specifically designed for preventing migraine and uses antibodies to alter the activity of chemicals in the brain. Further trials will need to assess the long-term effects. Research has shown a chemical in the brain – calcitonin gene-related peptide or CGRP – is involved in both pain and sensitivity to sound and light in migraine. Four drug companies are racing to develop antibodies that neutralise CGRP. Some work by sticking to CGRP, while others block the part of a brain cell with which it interacts. Clinical trials on two of the antibodies have now been published in the New England Journal of Medicine. One antibody, erenumab made by Novartis, was trialled on 955 patients with episodic migraine. At the start of the trial the patients had migraines on an average of eight days a month. The study found 50% of those given the antibody injections halved their number of migraine days per month. About 27% did have a similar effect without treatment, which reflects the natural ebb and flow of the disease. Another antibody, fremanezumab made by Teva pharmaceuticals, was trialled on 1,130 patients with chronic migraine. About 41% of patients halved their number of migraine days compared with 18% without treatment. Prof Peter Goadsby, who led the erenumab trials at the NIHR research centre at King’s, told the BBC: “It’s a huge deal because it offers an advance in understanding the disorder and a designer migraine treatment. “It reduces the frequency and severity of headaches. He said other data, not published in the latest studies, suggested a fifth of patients had no migraines at all after treatment. The antibodies are not the only preventative drugs for migraine. Others include former epilepsy and heart disease pills as well as botox. But Simon Evans, the chief executive of Migraine Action, said those drugs came with a lot of side-effects and did not work for everyone. “Some doctors give patients a choice of being angry or fat-and-dosey and the drug they give them depends on their answer,” he said. The hope is discovering CGRP and precisely targeting it with antibodies should lead to fewer side-effects. Both studies say long-term safety data still needs to be studied. The problem with antibodies is they tend to be more expensive to make than other therapies. Prof Goadsby thinks patients who get no benefit from existing treatments or cannot cope with the side-effects are those most likely to benefit. Dr Andy Dowson, who runs headache services in Kent and London, said: “I am really enthusiastic we have something new that’s coming, but we need to know cost, who will respond and a lot more detail as we go down the line.